CONTENTS INCLUDE: One High Quality Windbreaker; Contents Come New In A Sealed Bag. MATERIAL: Made of 100% Premium Nylon; Features A Full Zippered Front & 2 Zippered Pockets; Features Elastic Cuffs & An Elastic Bottom; Machine Or Hand Wash; Unlined; Product Weight 5.6 oz. SIZING: Please See Sizing Image For More Details. Sizes Run Slightly Big For That True Retro Feel! ABOUT FUNNY GUY MUGS: This Windbreaker Was Created Exclusively By Funny Guy Mugs. Funny Guy Mugs Is A Trusted Company Founded By Brothers Whose Mission Is To Create High Quality Products That Put A Smile On Your Face! LOOK & FEEL THE 80'S & 90'S: A Must Have For Any 80's Or 90's Party! Also Perfect For An Epic Windbreaker Family Photo!! 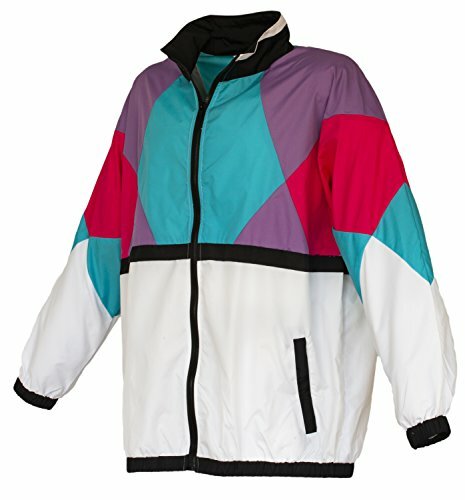 When You Slip On This Windbreaker, You Will Feel The Force Of The 80's And 90's Throughout Your Entire Body! TRUE HIGH QUALITY WINDBREAKER: They Are Made Of 100% Durable Nylon To Maintain That True Retro Look And Feel, Not Cheap Sweaty Polyester!! The 80's & 90's Deserve The Best!! Also Features Two Convenient Zippered Pockets To Keep Your Cassette Tapes Or Other Belongings Secure!! PRACTICAL & STYLISH: More To This Windbreaker Than A Gnarly Good Looking Party Accessory!! Jacket Is Unlined For A Versatile Lightweight Feel Perfect For A Night On The Town Or Run In The Park! The Jacket Is Also Waterprooof, So The Wind And Rain Are No Match For This Windbreaker!! A UNIQUE GIFT: Looking For A Unique Gift For Yourself Or A Gift For Someone Who Has Everything?? Need A White Elephant Gift? Your Search Is Over, This Windbreaker Is For YOU!! FUNNY GUY MUGS: This Is An Official Funny Guy Mugs Product. Funny Guy Mugs Is A Family Company Founded By Brothers Who Strive To Create High Quality Products That Put A Smile On Your Face.